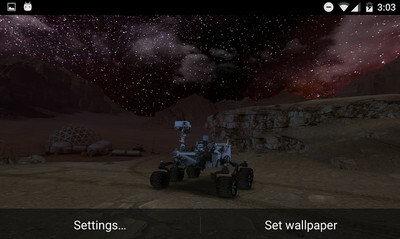 Get Mars to come to you in this beautifully detailed Android LWP. 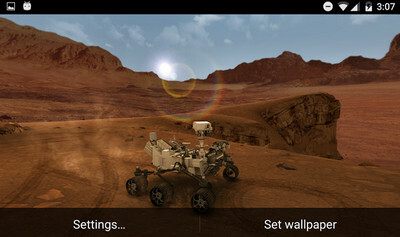 My Mars (3D Live Wallpaper) 1.3 puts the red planet in your hands through the eyes of the lovable Mars rover. Download now, it is the 360 experience! Clear off your homescreen because you're going to want to get the full effect of this jaw-droppingly impressive Live Wallpaper. Mars has been in the news a lot lately and how better to reflect each new discovery than a LWP featuring the red planet and the Curiosity Rover?! The Rover actually moves around the screen which just makes this wallpaper even more awesome. - Martian landscapes: Orange sky, blue sunsets, “Foboslit” nights with the myriads of stars..
- The 3D model of Mars rover was patterned in details after the real rover Curiosity. - Interactively activate a different equipment of the rover with just one tap. - Study how the rover moves and works. 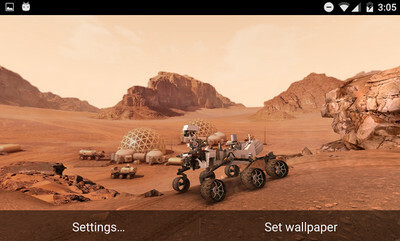 - The funny character will live and explore Mars on your device home screen day-by-day. - Day and night follow each other smoothly. The Martian sun moves in accordance with your time zone. 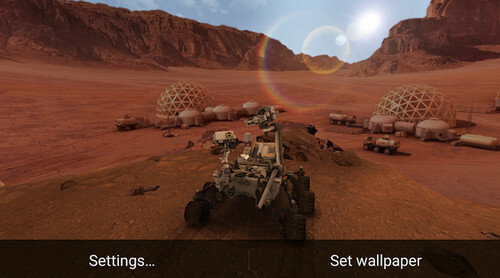 - No need to journey to Mars, get it on your Android!